This is Kahn Santori Davison’s year. All of his creative worlds are converging. For starters, he will host the Kahn & Friends Poetry Show for National Poetry Month at the Wednesdays LIVE @ Bert’s series. Later this month, he will serve as a Writer-in-Residence at the Carr Center (with Qiana Towns), working with underserved Detroit Public Schools students. He is the new editor of our upcoming AUX Media imprint, launching the Ribbit.tv anthology MONUMENT, representing some of the top bands in the nation. On July 22, he will launch his first full collection, BLAZE. 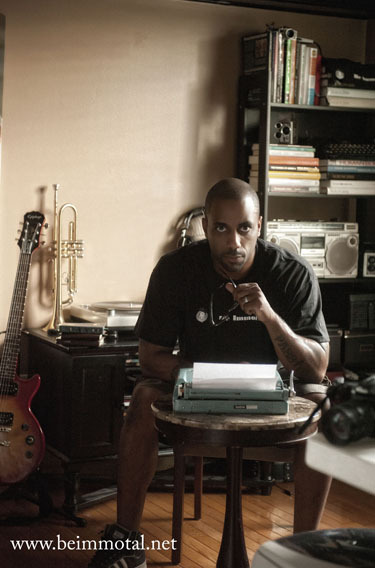 Owner of a photography studio as well as Primal Immortality Art and Shirts, this columnist, band member (Kaos), poet, Cave Canem Fellow, editor and soon-to-be author has been working hard for a long time. Kahn’s work as a photographer is amazing—he gets the “right” shot, much like a one-take movie director. I know him from way back, when Detroit’s literary scene ran hot, then very cold due to massive cuts in arts funding in our state. What’s special about Kahn is that he never gave up—I view him as a fellow survivor. His moving posts about his family’s tragedy inspired me while I was miles away (down in a Tennessee holler, no less) to write about my own family. He understands that art is life. Keep up the good work, Kahn. Previous Previous post: Introducing new contributors for The Blood-Jet!